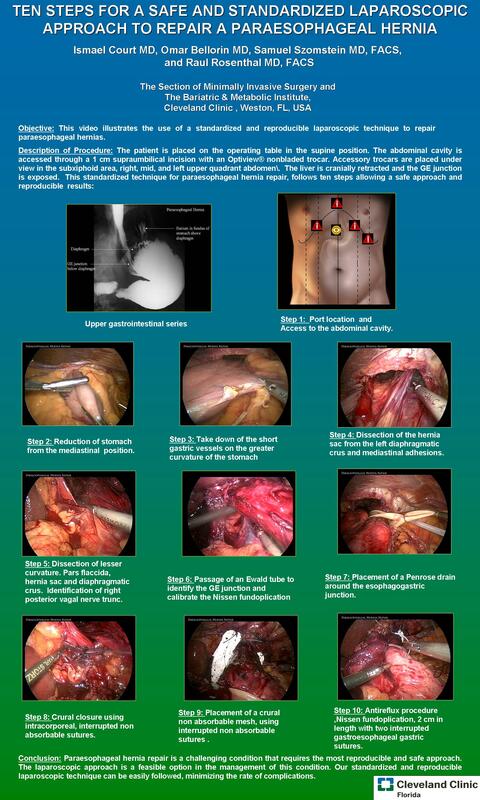 Nine Steps to Follow for Safe and Standard Approach for Laparoscopic Paraesophageal Hernia Repair. Objective: This video illustrates the use of a standardized and reproducible laparoscopic technique to repair paraesophageal hernias. Description of Procedure: The patient is placed on the operating table in the supine position. The abdominal cavity is accessed through a 1 cm supraumbilical incision. Optiview® nonbladed trocar and accessory trocars are placed under view in the subxiphoid area, right, mid, and left upper quadrant abdomen. The liver is cranially retracted. This paraesophageal hernia repair standardized technique, follows ten steps which permit safely to obtain an adequate result: 1) Reduction of stomach from the mediastinal situation. 2) Take down of the short gastric vessels. 3) Dissection of hernia sac from the left diaphragmatic crus and mediastinal adhesions. 4) Dissection of lesser curvature, hernia sac and crus and identification of right posterior vagal nerve trunc 5) Passage of an Ewald tube to identify the GE junction and calibrate the Nissen wrap 6) Placement of a Penrose drain around the esophagogastric junction. 7) Crural closure using interrupted non absorbable sutures. 8) Placement crural non absorbable mesh, using interrupted non absorbable sutures. 9) Antireflux procedure, Nissen fundoplication, 2 cm in length with two interrupted gastroesophageal gastric sutures. Finally, thorough hemostasis, suture closure of all trocar sites. Conclusion: Paraesophageal hernia is a challenging condition that require the most effective and safe approach. The laparoscopic approach is feasible option in the management of this condition. We present a standardized and reproducible laparoscopic technique that can be followed, and can contribute to decrease complications.